Honestus Esse is an initiative by the WolvHaven staff to make members more aware of their actions and how it affects the community. What does “Honestus Esse” Mean? “Honestus Esse” means “to be honest” in Latin and we would like all people to express their honest opinions in this activity. Similar to the craze over anonymous feedback tools such as sayat.me and sarahah a few months ago, we want to provide a way for all members of the community to provide anonymous feedback to each other. In the WolvHaven Demographic Census 2017, several of you have noted that at least one or more people on the server annoyed you. 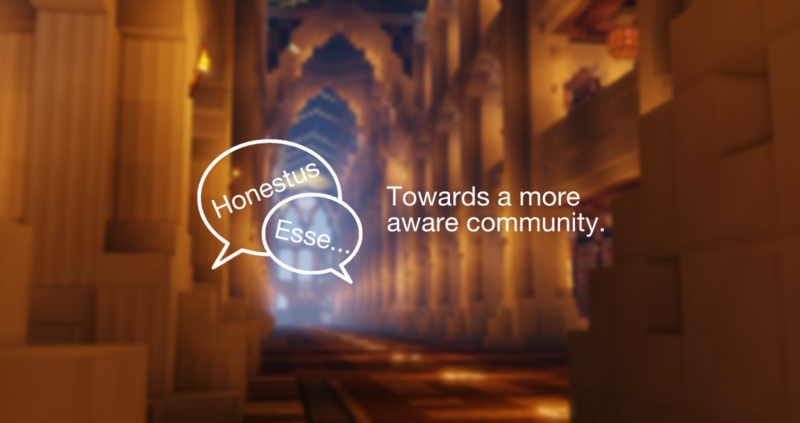 Therefore, Honestus Esse was created to compile and send feedback to people on the server in order to make each other more aware of their actions, how they affect and/or make others feel and how they can improve to help build a better community together. Holding a grudge or have prejudices against someone else is not healthy for our community in the long run. Let’s build bridges – not divide ourselves. After the deadline, all responses will be compiled & reworded (if needed) into a document for each person. You will remain anonymous. Be Constructive – Don’t just full out bash another person. Kindly suggest ways and steps they could take to improve on their behavior. Be Respectful – Please be respectful in your feedback. Remember, this is an initiative to build a community that is more aware of how their actions affect others. Upon receiving feedback that is addressed to you, please take the time to look through and reflect. Please don’t go on a witch-hunt, accusing or suspecting others of writing something that you disagree with. Remember – this is about becoming more aware of the way your actions affect others. It would be appreciated if one learns from the feedback given to them and tries to improve based on that; instead of outright denying it before thinking it through and continue bearing a grudge against people. You can start sending feedback till December 31 2017! Click here for the form! Q: Will my identity be kept confidential? A: Your identity will remain anonymous and confidential when the feedback is collated and sent over to the recipient. Q: Why is there still a need to collect my identification if I am submitting anonymous feedback to another person? A: While the responses you send will be delivered to the recipient anonymously, we want to have a platform where people exercise their anonymity with responsibility. Honestus Esse should not be used to send hate to another person – it would defeat its overall purpose. Q: Who has access to the identification tied to whoever that sent the feedback? A: Only SilverWolv has access to the responses being sent – not even the other admins have access to it. Q: Why will my feedback be reworded if needed? A: The feedback will be reworded if necessary in order minimize any forms of misunderstanding or to remove certain aspects that could reveal your identity unintentionally.